Triple-digit temperatures, extremely low relative humidities, dense vegetation that has not burned in decades, and years of extended drought are all contributing to the explosive growth of wildfires throughout Southern California. The Station fire, which began Aug. 26, 2009, in La Canada/Flintridge, not far from NASA’s Jet Propulsion Laboratory, had reportedly burned 105,000 acres (164 square miles) of the Angeles National Forest by mid-day Aug. 31, destroying at least 21 homes and threatening more than 12,000 others. It is one of four major fires burning in Southern California at the present time. This image was acquired mid-morning on Aug. 30 by the backward (northward)-viewing camera of the Multi-angle Imaging SpectroRadiometer (MISR) instrument on NASA’s Terra satellite. The image is shown in an approximate perspective view at an angle of 46 degrees off of vertical. The area covered by the image is 245 kilometers (152 miles) wide. Several pyrocumulus clouds, created by the Station Fire, are visible above the smoke plumes rising from the San Gabriel Mountains north of Los Angeles in the left-center of the image. 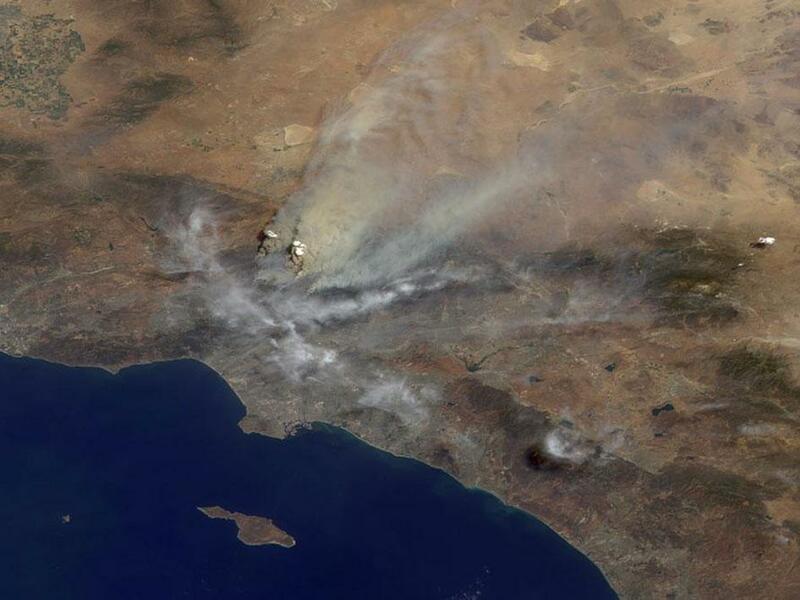 Smoke from the Station fire is seen covering the interior valleys along the south side of the San Gabriel Mountains, along with parts of the City of Los Angeles and Orange County, and can be seen drifting for hundreds of kilometers to the east over the Mojave Desert. In this picture, the plume is injecting smoke more than 7 kilometers (4.3 miles) above sea level. MISR was built and is managed by NASA’s Jet Propulsion Laboratory, Pasadena, Calif., for NASA’s Science Mission Directorate, Washington, DC. The Terra satellite is managed by NASA’s Goddard Space Flight Center, Greenbelt, Md. The MISR data were obtained from the NASA Langley Research Center Atmospheric Science Data Center. JPL is a division of the California Institute of Technology.